The advent of March, and early spring, is particularly welcome this year following an uncharacteristically cold and stubborn winter. 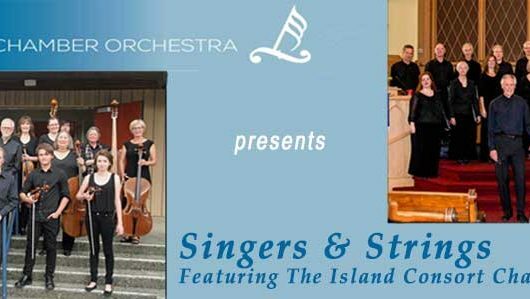 And the music of the Nanaimo Chamber Orchestra, under the direction of Karl Rainer, is a welcome partner to the season as it presents the program, “Singers & Strings”. The “Singers”, the Island Consort chamber choir directed by Bruce Farquharson, will join with the NCO as guest performers, broadening the scope of music and adding extra sparkle for the audience to enjoy. The Orchestra alone will play the following: Mozart’s Divertimento I, K. 186 which is one of 4 such works known as the “Salzburg Symphonies”, composed in 1772; “Melancholia”, a beautiful serenade in the Romantic style of pastoral images and serenity composed by Eduard Nápravnik, a little-known late-19th Czech composer and organist who moved to St. Petersburg to become a prominent conductor; and “Concerto Grosso for Strings”, composed in 1950 by Ralph Vaughan Williams, a work in 5 contrasting movements that was designed for string players with a wide range of abilities. The Orchestra and Consort will perform Vivaldi’s “Magnificat”, with soloists from the ranks of the choir; sopranos, Skye Donald and Sharon Sinclair; alto, Monica Morosan and tenor, David Brown. Although Brahms’ “Geistliches Lied” has traditionally been organ-accompanied, English Conductor, John Eliot Gardiner has recently written the accompaniment for strings, which we have obtained for these performances. The choir will finish with Mozart’s short but lovely “Ave Verum Corpus”.